Many coaches think their team will perform well if they can get all athletes hyped up before competition. Thus coaches use pep talks, team cheers, and loud ‘pump up’ music as a means to get athletes psyched up for competition. Unfortunately, these ‘get psyched’ techniques do not work for every athlete. 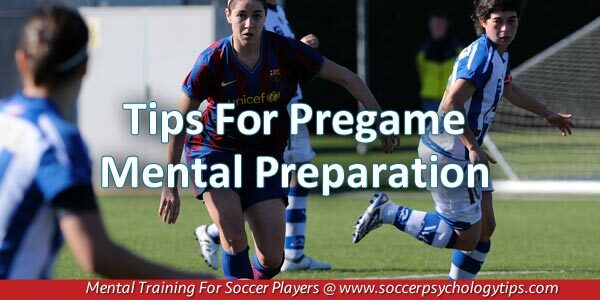 Every athlete is different when you talk about optimal pregame intensity. If you have athletes that are more anxious, psych up strategies move these athletes into an over-anxious state. Anxious athletes may take several minutes to settle into their game, and for some of these athletes, they never seem to come down from that nervous feeling for the duration of the game. To make matters worse, the more important the game, the more revved up these athletes become, which usually leads to tight play and early mistakes. As an athlete, you want to be in an optimal zone of intensity prior to competition, that is you need to move into a zone where you are mentally prepared, emotionally ready and properly focused for the start of a game. If you are more of a nervous or anxious type athlete, you would be better served to learn how to calm down prior to a competition. US Women’s National Soccer Team forward, Alex Morgan, understands the importance of getting her mind right before the start of a game. Part of Morgan’s pregame routine is to move into a state of calmness which she credits for her successful level of play in the biggest soccer tournaments, such as the 2012 London Olympics, the 2015 World Cup and the 2016 Rio Olympics. When your heart is pounding, your thoughts are racing, your focus is pulled into a thousand directions and you become overwhelmed with anxiety, it’s impossible to play at your peak. Therefore, you might benefit from learning how to relax your mind and body prior to competition so you can be mentally ready to perform well when the whistle blows. 1. Deep breathing – Taking several deep slow breaths for a period of time will slow down your respiration and heart rate and provide you with a sense of calmness. 2. Imagery – Visualizing yourself in a calm surrounding, like the beach, can be a soothing escape before a game. 3. Listening to music – Slow tempo music will have the effect of slowing down your heart rate and distract your mind from thinking about the game too early before its start. 4. Relaxation or massage – these techniques serve to relax your muscles and body before game time. First, know what works best for you–do you need get pumped up or calm down before competition? Choose a strategy that works for you. While meditation may benefit some, other athletes may not find that technique too relaxing. For example, some players on a college hockey team I worked with complained that they were too relaxed at the start of the game after doing visualization before the game! Practice your relaxation technique. You need to become proficient at any technique for it to work in your favor. Managing your fear is also key to helping your control your emotions before a game. A relaxed mind and body optimally prepare you to play your best from the very first minute of a game!